But life is what it is and there were some top class performances at these Games, combined with some disappointing ones. At the end of the day, these Games were a bit of a mixed bag. Certainly, the medal tally was up – 2 silver and 3 bronze is the highest number of medals since the 5 won in 1990. But what about the depth – one recognised way of judging comparatively is on a points score from 8 points for 1st down to 1 for 8th place. Removing the para events to avoid distortion (and the fact that this time round the para events were restricted to 7 athletes), then we mustered a total of 47 points. That compares with 55 in Glasgow (from far more athletes), 54 in Delhi 2010, 20 in Melbourne 2006 and 40 in Manchester 2002. 800 metres. Jake Wightman excelled at these games. On paper, Jake had the 11th fastest 800 metres pb of the starters so even making the final was punching above his weight, but Jake is an astute and competitive runner. The 800 metres is probably his weaker event but 4th place was an outstanding run. Guy Learmonth was 6th at the Glasgow Commonwealth Games and we were looking at a final place at least, so to go out in the first heat in 1:49.20, four seconds down on his best, was an extremely disappointing exit. 1500 metres. Jake Wightman was a star of this Scotland side and every one of his races at 800 and 1500 was well run and executed. His 1500m final was excellently judged and he deservedly went home with a tangible reward. Chris O’Hare is an experienced campaigner and sets high standards for himself but he now appears traumatised by recent championships. His qualifying heat was a messy run and he was never in contention in the final. Marathon. Callum Hawkins was on target for a memorable victory until the heat and humidity took its toll with a devastating outcome. This was a race that tested every athlete and, behind him, Robbie Simpson put in a courageous performance to come through for an unexpected bronze medal. High jump. Both the Smiths came through the qualifying round, matching the Scottish qualification standard with their 2.21 clearances. Allan Smith performed superbly in the final and his 2.27 for 5th place was the highest he has ever jumped outdoors. David Smith disappointed in the final failing to equal his 2.21 qualifying jump. Hammer Superb from Mark Dry, a 2nd bronze medal, especially after all his hip problems, was remarkable. Chris Bennett again let the occasion of the Commonwealth Games get to him. A potential medallist with his pre-Games throws, his throws in Glasgow and the Gold Coast have been the poorest of all his competitions in the last 4 years. 400 metres. Zoey Clark was the 16th fastest on PBs of all the entries here so reaching the final was going to be a tough ask. She would have to produce an improvement on her 51.81 PB to have a chance but it didn’t come and 52 seconds was never going to be good enough. 800 metres. Lynsey Sharp is an experienced campaigner and knows what is needed to qualify for finals. With the event going from 3 heats to a final, it was always going to be ferociously competitive and 2:01.33 was not what was required, only the 14th fastest of all the competitors. 1500 metres. Our two competitors, Eilish McColgan and Steph Twell, were looked on as using the 1500 as a warm-up for their main race, the 5000, but both possibly took more satisfaction from this performance than their stronger event. Both struggled with the early pace but came through the field well enough to finish a creditable 6th and 7th. 5000 metres There were hopes for Eilish McColgan with her end-season form that she could be a medal prospect but she never really got to grips with the leaders. She was ahead of the bronze medallist, Laura Weightman, after 3000 metres but a final 2000 in 6:12 saw her finish 9 seconds behind Weightman in 6th. Steph Twell has now run the 5000 at 3 Games and has never bettered 16 minutes in any of them. She was well placed in 6th at 3000 metres but struggled for the rest of the race, falling back to a very disappointing 14th. 10000 metres If you are going to do the 10000 metres justice, don’t do a triathlon a few days before. That seemed to be the message for Beth Potter, although the triathlon (in which she finished 12th) was always her priority this time round. 400 metres hurdles If ever an athlete looked prepared for competition, Eilidh Doyle is that athlete. Yet again, she performed superbly to gain a 3rd silver medal becoming only the 2nd Scot to gain a medal at 3 consecutive games (Yvonne Murray was the other). In a more competitive hurdles event than in Glasgow, she was the only one of the medallists to match her qualifying time in the final. 3000 metres steeplechase When your best time from last year is 9:37.94 and you finish last in 10:21.72, your slowest time since 2013, that is bad. This was a poor performance from Lennie Waite, an experienced steeplechaser, who should have greater consistency. High jump Nikki Manson competed well in her first Games. There were 6 athletes with superior PBs in the field and Nikki finished in an expected 7th. 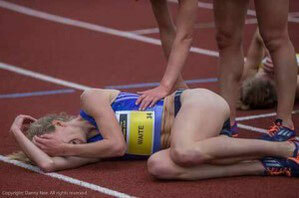 Her 1.84 was below the Scottish qualifying standard but saw her finish in the top half of a field of 14. 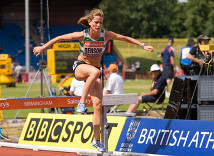 Heptathlon Holly McArthur, still an under 20, put in a professional performance in her first appearance at a senior Games. Let down on day two by a weak long jump and javelin throw, it didn't have any impact on her placing and she kept on to 10th in what will undoubtedly have been a great learning experience. 4x400 metres relay. There were great expectations from the Scottish quartet but this was a highly competitive relay. 6th place was a disappointment but it took a Scottish record to get there with the quartet become the first ever Scottish team to better 3:30. T35 100 metres. On paper this looked a certain silver medal for Maria Lyle and so it proved. But she ran slower than at any 100 since 2013 and finished over 1.5 seconds behind the winner. The race itself was a disappointment where the 7th athlete can set a PB of 26.49 in a race won in 13.58! T54 1500 metres This was a proper race with very little between the top 5 in the field. Samantha Kinghorn finished 4th , just edged out of the medals by less than a second. T54 Marathon. With 7 starters, Samantha Kinghorn again finished in the middle spot, 42 seconds behind the bronze medal position. T38 Long jump. 6th on paper, Amy Carr couldn’t quite match her best and finished in 7th position. 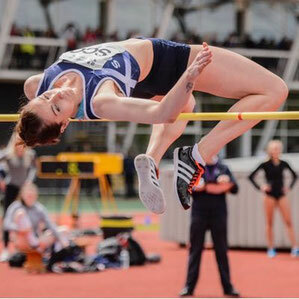 High jumper Emma Nuttall has had to withdraw from the Scotland team for the Commonwealth Games next month. In a new blog that she has started on https://emmanutt.wordpress.com she has talked about the experience. Thanks to Emma for allowing us to share this. This is not the cheeriest of posts to start my blog with, but here goes. About a month ago I had to make one of the most difficult decisions I’ve had to face. I decided to withdraw from the 2018 Commonwealth Games as part of Team Scotland. This decision does not come lightly and I’m not going to sugar coat anything – I’m devastated. Throughout my high jump career I have suffered various issues with the knee on my take off leg. Unfortunately this flared up again, and while it is not anywhere near as bad as previously it has come at an awkward time away from the Games. On one hand I could have maybe recovered enough to attempt to jump in April the Gold Coast, but on the other hand I could completely mess up my knee. So there you have the dilemma; do you risk it for the opportunity to represent your country or do you take a step back and accept your time is not now? Anybody who knows me well enough knows that I am not an athlete that likes to just ‘take part’ in a competition, especially one like the Commonwealth Games. I want to be competing with the other girls and doing so to the best of my ability. The reality is, even if we got me in a position that I could jump in April I would not have had the preparation that would set me up to compete to the best of my ability. In the Glasgow 2014 Commonwealth Games I did not have the preparation required to compete to the best of my ability. I was in the shape of my life before I had my first issue with my knee in April 2014. By the time the Games came round I had no idea if I was going to do one jump or if I was going to make it through. I swore I would never go to a competition feeling that way again. It was heart breaking to not be able to perform like I knew I could in front of a home crowd whilst representing my nation, and I do not want to feel that again. I do not want to disrespect my country by taking a place when I am not able to perform, and disappoint both them and myself. I only have a short period of time to be an athlete and I try to live my life focused on the good ‘what if’ scenarios rather than the bad ‘what if scenarios’. This comes from one of my favourite poems by Erin Hanson. What if everything you dreamed about a certain thing came true? It would make that difficult decision 100% worth it. If you focus on the bad ‘what if’ potentials you would never make a difficult decision in your life and never experience something that could bring you such joy and happiness. That is why I have made the decisions I have to focus on my dreams and goals as a high jumper. And those dreams and goals started to come true. Thanks to my awesome coaching team and training partners I achieved my 2017 goal of meeting the qualification criteria for the 2018 Commonwealth Games. I cannot even explain the emotion I felt when I jumped my second 1.86m of the summer. It had been such a long and trying road to get to that point and although 1.86m is not a great height, it meant so much to me to achieve that. To then find out I had made the team for Gold Coast was another day I could not hold in the emotion. Every decision I had made and everything I had done was worth it. That is what makes this decision so hard to accept. I know it is the right thing to do, and I know it will prolong my career as a high jumper, and I know there are other things to come and life does not end with the 2018 Games. That does not make it any easier. I’m not going to lie, I contemplated giving up. Every athlete comes to the point in their career where they question if it is worth it any more. That thought has run through my head many many times in the past 4 years. Last year I told myself if I did not make the Gold Coast Games or I did not perform well there I would stop high jumping and get on with ‘normal’ life [what even is a ‘normal’ life?]. However, when it came to hearing from my coach that I probably should withdraw from the Games I knew I was not done. The thought of retiring did not give me comfort or relief but brought panic and sadness. I have not come close to reaching my potential and showing the world what I can do and so I am not going to give up. I do not want to live a life filled with regret for not sticking it out another block of time and seeing if I can get 100% healthy. I know there will be hard times ahead and when the Games are on it will be a very difficult period for me. However, I am in a better place mentally than I was in previous years when injury took me into a dark hole and I know I can get through this and come out the other side stronger. I had my cry about the situation and then turned my mind and focus to getting back to jumping. I need to keep focused on the good ‘what if’ scenario like I have done to get where I am today. You have not seen the last of me yet! It helps to talk through these kind of issues you face as an athlete and I’m lucky enough to have a great group of coaches, training partners, friends and family around me that support me. I had so many lovely messages following the announcement and I want to thank all those people who reached out and still believe in me as much as I do. We all go through these experiences as athletes and it helps to know you are not alone. If you need someone to talk to do not be afraid to reach out and have a chat. Good luck to all athletes heading out to Australia, I will be cheering you all on from home! 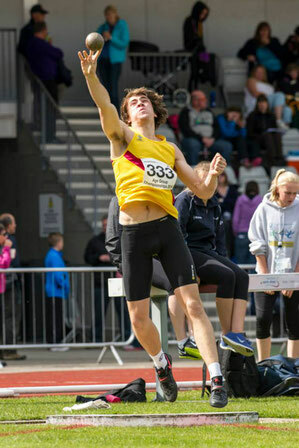 When the excellent Inverness thrower George Evans (pictured, by Bobby Gavin) defends his shot and discus titles, now in the colours of Strathallan School, at the Scottish Schools Championships at Grangemouth Stadium on June 10 and 11 he will also be a firm favourite to retain the AH Dalrymple Trophy which is presented to the outstanding male thrower at the meeting. If he does win on what will be the 51st awarding of a trophy gifted in memory of a former Golspie High School PE teacher and throws coach, he will be maintaining a remarkable tradition, continuing in a notable line of North of Scotland holders, many of whom have gone on to further success as senior athletes. George Patience (Fortrose Academy) who threw the discus for Scotland in the 1986 Commonwealth Games in Edinburgh, was the first to carry the trophy back across the Highland line in 1974 and shot-putter Peter Venters took it back to Golspie the following year. It was back in Golspie a decade later when hammer-thrower Russell Devine won it in 1985 and 1986 en route to a Commonwealth Games place in Victoria, Canada in 1994. Eight years later it was back in the North for seven more mighty years, the amazing Graeme Allan (Milne's High, Fochabers) almost getting it to keep with four wins from 1994 to 97, then Adam Major (Elgin Academy) winning in in 1998 and 2000, split by Scot Thompson (Nairn Academy) who later became a mainstay of many Scottish teams at both shot and discus. When the former Culloden Academy pupil Evans, who went to Strathallan on a scholarship) set new figures for the senior (17-19) boys shot and discus last year it was the prelude to an even greater achievement when he travelled with the Great Britain team to Columbia to capture a discus bronze medal at the World Youth Championships with a fine throw of 60.22 metres and later added a silver for Scotland at the Commonwealth Youth Games in Samoa in September with a throw of 58.19. AH Dalrymple Trophy for the best thrower (male) at the SSAA Champs - given in memory of my coach Alex Dalrymple, the former Golspie PE teacher and Glenmore Lodge Warden who died at the age of 39 in 1962! His daughter Liz now married to Brian Prosser, teaches at Meldrum Academy! 2015 George Evans (Strathallan S) (formerly at Culloden Acad). In reaching their decision the selection panel are acting as experts and athletes agree that in so doing the panel exercises judgment and discretion which are not in themselves capable of challenge. I sent the appeals process document to my lawyer friend, and talked with him regarding my meeting notes. He was great and immediately spotted an error in my meeting notes. I wish I could post my meeting notes to show you the whole process, but you’ll have to settle for a discussion of what occurred because of confidentiality. I noted some statistics in my meeting notes that were errors and filed my appeal based on this. I’ve taken out the meeting note quotes, but you can see part of my appeal below. First, my personal best is 9:40, putting me 13 seconds outside of the top 8 average. Second, 8th place at the 2013 World Championships was 9:34, which is only 6 seconds outside of my personal best. Third, the 2009 statistic is an outlier in the top 8 average and skews the average top 8 finishing time. The time to make top 8 in the women’s steeplechase final has consistently been 9:32-9:35, with 2009 being an outlier in performances at a World Champs (2007: 9:35, 2009: 9:14, 2011: 9:32, 2013: 9:34). Six seconds outside of a top 8 finish is significantly more achievable than 20 seconds. I feel that the wording of the meeting notes incorrectly highlighted a 20 second gap between my current form and the opportunity for me to finish in the top 8. Forming the impression that I am 20 seconds outside of top 8 finish minimized the impact of the positivity in some of the meeting comments. If I am capable of running a PB and performing well in the heat, then running 6 seconds faster than 9:40 is realistic, and was supported by members in the committee meeting. It is undeniable that I am on an upward curve with top 8 potential. The 20-second comment is an error and not applicable to the selection process. However, it made an impressionable impact on members of the selection committee, leading them to conclude that I do not demonstrate realistic top 8 potential this year. I included other information regarding policy inconsistencies. Several athletes—I think at least 7—were selected with one qualifying time. Also, these athletes are outside of a top 8 ranking based on previous results. However, for some reason, these athletes were selected, whereas I am left at home. Overall, with my coaching change and significant improvements in my racing and training, Beijing would serve as a springboard for me to lower my current world ranking and potentially reach the highest finish of any female British steeplechaser to date. The endurance director believes in my ability to qualify for Rio, and I need the experience on the world stage. In the past 2 months I have achieved new personal bests over both 3000m SC and 1500m. The training has been solely targeted at being in the best form possible at the World Championships. Were it not for an off performance of .3% off of the 9:44 QT (when I ran 9:45) I could have avoided this appeal process. I submitted this appeal late on Tuesday, and then I waited. This morning, I got a call from the director of appeals informing me of the ‘uncertain’ outcome of my appeal. Essentially, the appeals panel agreed with the basis of my appeal. My outcome at the selection meeting was based on faulty statistics, and the selection committee needed to reconvene and use the correct statistics in determining my fate. So, now I am left with no transcript of the meeting notes. For all I know, a group of people walked into a dark, smoke filled room and pulled a ‘NO’ out of a hat. Considering the mistake that I spotted in the statistics, combined with the inconsistencies in team selection, I can’t help but sit here and feel that the British Athletics process is unfair to its athletes. It is time to reassess the qualities of the authorities, to raise awareness to sponsors of the process they are supporting, and to demand change and transparency. There will be no British steeplechasers at the World Championships. I will not get to serve as an inspiration for the next generation of athletes. I will sit at home and watch people who I beat consistently this season line up on the world’s biggest stage for athletics. I won’t get to toe the line, and I will never understand how this decision was reached other than the fact that ‘experts’ felt it was best that I not race. I hope in sharing this story I can prevent other athletes from enduring this same nightmare. I hope I can instigate change. I hope I can raise questions and suspicions. I hope I can help the next steeplechaser line up at the World Champs. Following on from the hype the SATS Challenge rankings brought in 2014 and the fact that Pitreavie topped two of the rankings, the club decided to incorporate the new SATS Performance tables into their Club Champs scoring format for this year. Previously the Five Star scoring system was used. Athletes were invited to enter five events over two days, with the younger athletes selecting two track, a jump, a throw and one other event of their choice. This was to encourage athletes to participate in all the disciplines. A lot of work went into hooking up the performance calculator to a recording system, which automatically calculated and tallied the points based on athlete performance in each event. The main contributor to this was Norma Bruce, who is better known in an officiating capacity. Campbell McNair, a parent of an athlete in the club was also involved and with their combined efforts the recording of the results and allocation of the points was really efficient on the day. The club is very grateful to Arnold Black for allowing it to use the performance calculator and assisting a new initiative with the club. All in all it was a fantastic event with some great performances;the Club saw Anna Gordon equal the Scottish Indoor U20 Pole Vault Record of 3.90m and Iona Crawford was the first to win the Sean McQueen Memorial Salver. 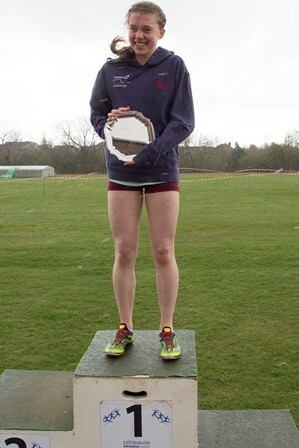 This salver will be presented each year to the best 300 or 400m performance across all the age groups. 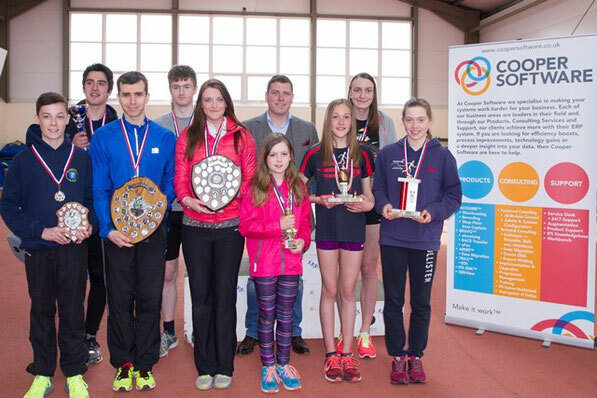 In addition to the great performances the Pitreavie AAC Club Champs (which was sponsored by local company Cooper Software) displayed a fantastic amount of initiative, teamwork and volunteering which they hope to build on this year. If any other club is interested in the scoring system then please let us know. Thanks to Nicola Moriarty for this item. My journey to the Glasgow Commonwealth Games started in about 2006 when I started writing down every single training session with a "Glasgow 2014 Back the Bid" pen. Maybe I haven't done enough training because it's only been running out of ink since April!! In the years between 2006 and 2014 I always believed I could make it, even though there were some pretty tough times in that period. And when I believe I can do something I have to go out and do it just to prove to myself that I can. So New Year was a scary one- 2014 had arrived and I had the grand total of 0 out of 2 required qualifying marks for the Commonwealth Games. After qualifying in America and Loughborough, I had a great preparation for Glasgow at home in Gullane until the 28th July. For me the home advantage was all about staying at home until just a few days before I competed so that I could stick to my normal routine, and see my coach Stuart Hogg as much as possible. One of the things that was special about the home Games was how many familiar faces there were amongst the volunteers, from the warm up area to the call rooms and out on the track- it was one of those little things that made you feel a wee bit more relaxed. Just before my heat I saw Janice Hendry who was a team manager for lot of British schools trips- I think giving her a hug after my heat was one of the most emotional moments of the whole experience. My coach told me I had to acknowledge the crowd which I never normally do and even though I thought I was going to cry when I heard the roar I managed it (phew!!). It was so much louder than it seemed the day before in the stands, and the cheer for us Scots was SO much better than everyone else's! Lots of people have asked me how nervous I was for my races but in my limited experience I seem to feel less nervous at championships than I do at other competitions. When I get out onto the track I just think to myself "this is exactly what I have trained for and this is what I love doing". I had nothing to lose and everything to gain- sometimes logic is all you need to stay calm! After my heat there was THAT interview which, particular thanks to Chris Bennett and Derek Hawkins, I will never live down. 3 words- school sports day! After a warm down, chat with my coach Stuart Hogg, some food and sleep it was the day of the semi finals. On the day of an evening race I just chill out, read my book (currently "If this is a man" by Primo Levi), sleep and eat. I really believed I had a chance of getting to the final. I was in Lane 1 which is always a bit tricky because the of runners coming across from the outside and looking back on the race I could have gone out a little bit harder to avoid getting stuck in the pack. But that's a big part of my experience- learning about how to handle the village, the dining hall, the warm up area, the call rooms and finally and most importantly, championship racing. Now more than ever before I am driven by the quote that I saw after the World Juniors in 2012- "be proud of your progress but never satisfied". Glasgow 2014 absolutely confirms that these competitions are what I live for. The atmosphere and the occasion is everything you dream of it being. It is totally incomparable to any other races. But when it's over you suddenly feel a bit empty. You yoyo between being proud to have gone out there and done your best and gutted that you didn't achieve just a wee bit more. My next focus is the Scottish Championships in a couple of weeks and then the start of the next stage of my life in Dundee. Sometimes people outside of athletics forget how big a part coaches play not just in our athletics but in our lives. My experience in Glasgow reminded me how fantastic my coach Stuart Hogg is. We get on so well and it's great to be able to have a bit of banter in the warm up area when things can get a little tense! From his technical expertise to his knowledge of the effect of emotions on performance his attention to detail is second to none. He has coached people right to the very top level in sport in several different events and that experience means that he knows how to prepare his athletes both mentally and physically. He is a true legend of our sport and I am so very grateful to have his support and expertise, both as a coach, mentor and friend. 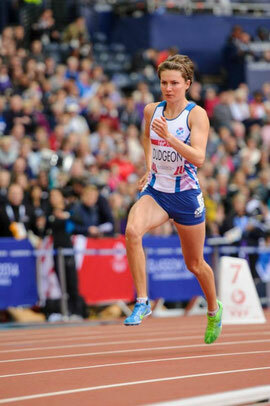 Emily Dudgeon qualified for the semi-finals of the 800 metres at the Commonwealth Games. She finished 4th in her semi final, just missing out on reaching the final when Lynsey Sharp and Jenny Meadows took the fastest loser positions from the other semi final. She is moving from Cambridge University to Dundee to continue her medical studies and her athletics career. The 2014 Commonwealth Games in Glasgow marks the return of big time athletics to Hampden Park – for many years the largest football stadium in the world. 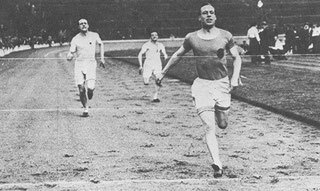 As Scotland’s national football stadium, Hampden has played host to huge spectacle over more than a century but while football has dominated its role, many of the UK’s – and the world’s – best athletes competed in track and field in the stadium, through to the 1950s. This is their story. Sarah Benson's dreams may have been shattered by missing out on Commonwealth Games selection, but it is a learning experience. She's putting it behind her and focussing on the future. This is her blog.